Amazing Arachnid Spiders that also CHANGE COLOR in COLD WATER! Just add room temperature water (NOT cold) and watch them grow! Add ice and the cold makes them change color like magic! 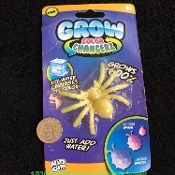 Grow Creature Figure Growing COLOR-CHANGER Tarantula.